In October and November 2013, the Gilmore Gallery at Peacham Library is featuring the work of students from the Atelier Kadunc Workshop. There are pieces in various media from artists that range in age from 9 to 87 years old. The Atelier Kadunc Art Workshop, established in 2010, is a studio in St. Johnsbury where artists of all ages and abilities are able to further their appreciation and study of fine art. It presents classes and workshops in pencil drawing, watercolor, oil painting, and sculpture – featuring instruction, interaction and debate among artists of all ages and abilities. The purpose of the studio is to provide the local community a venue and opportunity to expand and further the creative experience. Studies include and support a variety of media and styles; however, the focus remains on the old school foundations and traditional artistic methods. Atelier Kadunc is proud of the artistic talents that have come through its programs and workshops, as well as the body of work that continues to be created by its participating artists – who range in age from 9 to 87, with views and experience to match. 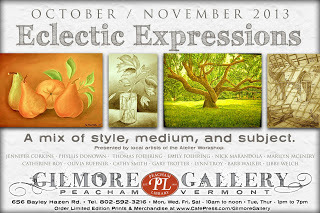 This local artist community is what “Eclectic Expressions” was created to showcase. An Artists’ Reception was held October 27 from 2-4 pm.